We would like to offer you all that you would expect to have an excellent holiday or just time out in Mission Bay Auckland.The air conditioned two bedroom unit is situated 200 metres from the beautiful safe swimming beach and the most comprehensive array of restaurants that the waterfront has to offer, including the famous Movenpick ice cream experience and movie theatres. Ideally situated only 6kms from Auckland city's tourism attractions..
Only a 2 minute walk to the public buses that operate every 10 minutes from Tamaki Drive to the city where ferry boats to AUCKLANDS famous RANGITOTO and WAIHEKE Islands can be caught! Back in the unit you may like to relax in the heated onsite spa or stay in and have a BBQ in the tropical courtyard with quality outdoor furniture. 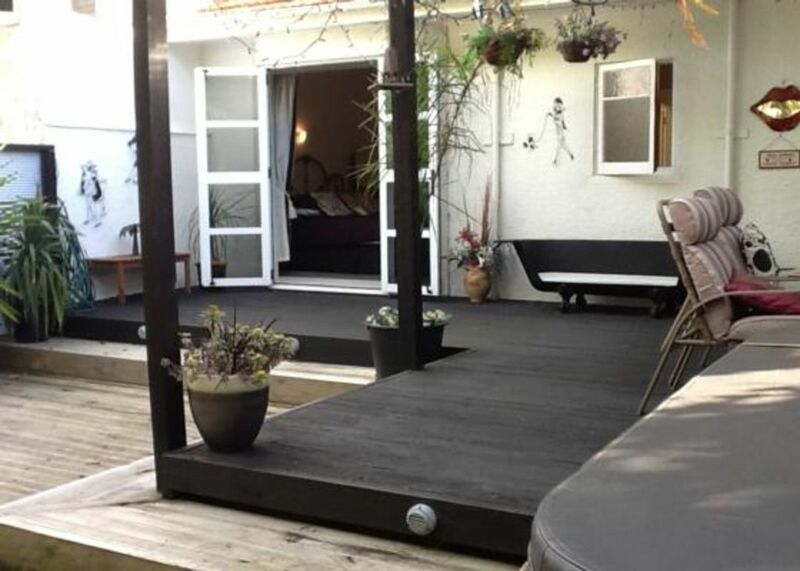 This deck area at the rear of the unit allows privacy and relaxed ambience, with the main bedroom opening directly onto this area, through french bay doors.All linen is supplied.Fully equipped kitchen. Off street parking. We know that your stay will be memorable.Looking forward to having you! Even if only for a memorable1 night stay, or a discounted longer one! Book me now! THE HOT SPA AWAITS YOUR ARRIVAL!! BUCKETS AND SPADES AND TRUCKS AND BALLS AVAILABLE FOR THE KIDS TO TAKE TO THE BEACH. BOOKS AND GAMES AND SOFT TOYS FOR YOUR CHILDREN TO SNUGGLE AND USE. Cleaning fee applies for stays of 1 night. No cleaning fee for stays of 2 nights or more. A WELCOMING PACKAGE OF WINE AND CHOCOLATES GREET YOU ON YOUR ARRIVAL FOR STAYS OF 2 NIGHTS OR MORE. ENJOY AN EARLY ARRIVAL AND LATE CHECKOUT. LOCATION! LOCATION! LOCATION ! BEACH! CITY! TOURISM! KELLY TARLTONS AQUARIUM! Only 6 km to Downtown Auckland with tourism galore . You can see the famous Rangitito Island from the letterbox . Excursions highly recommended from Downtown Auckland for day trips / walks . Water view from the lettterbox only 50 metres away . Full 24 /7 air conditioning if required. This is operated from the remote located in the pouch on the lounge wall . Please return the remote to this area prior to your arrival . Heat pump The remote for this is located in the pouch in the lounge wall. There are varying temperatures you can choose . Please ensure the heating is turned off prior to you leaving the house . Beds made upon arrival . Towels provided per person . Bathmat , handtowel , teatowels provided . In laundry / bathroom area . A small amount of washing powder supplied . Please replace if you use it all , so the next guests can also have some for their use . Dryer available in laundry area . Please remember to clean filter after your use . Free parking and car is parked directly in front of the house, under well lit street lighting . Viewable from the lounge window . Please park in front of the garage that says BIRDCAGE. Bath and Spa towels provided . Plenty of cooking and eating dishes for more than 5 people . Frypans , waffle maker , crockpot . Toaster, kettle . Spa pool in entertaining area. Please can guests sprinkle 1 tablespoon of chlorine in the spa each night prior to going to bed . Please ensure the RED LIGHT is ON AT ALL TIMES . DO NOT TURN OFF . Thankyou, so close only 200 metres to beaches and cafes , playground and the buzz of famous Mission Bay. Glad you enjoyed this special property . Clean, a little smaller than expected, but very nice outdoor space. Superb location for beach and restaurants. We had an awesome time at mission bay. The house was in perfect walking distance to the shops and our running event, which made it so easy. I will recommend it to others and use it again in future. Thanks. Just near the beach at Mission Bay, this is a great property. It's nicely furnished and clean. It suffers a little from the age of the building: the shower is a bit antiquated and I had to search for unoccupied power points. The courtyard out the back would be great for summer use. good location no access for disabled needs to be listed when you first view,also need to put stairs. also need to put cleaning duties on first view,most unusual to have to vacuum and clear beds,first time we have had to.should be listed on site.not left until you get to house. Restaurants galore only 50 metres walk . Downtown Auckland with theatres , tourism trips , Rangitoto and Waiheke and Devonport Cruises highly recommended . High class shopping everywhere. Famous America Cup venue of late and next America’s Cup . Bus transport 50 metres from the house into the city. Travel shuttle service to the airport and city .